I am not satisfied with the default background image that appears on the welcome screen while starting up PC running on Windows 7. I want to change that standard background image. How can I accomplish this? Steps to directly start with desktop screen in windows 8 release preview? Launch the start menu on your system by pressing the ‘Start’ button on the desktop. Locate the search box and type regedit into it. When the ‘Registry Editor’ window pop up on the screen, right click on the HKEY_LOCAL_MACHINE folder reside at the left pane. Choose ‘Find’ option from the menu pop up on the screen afterwards. Type OEMBackground into the search field and check whether it is visible under Computer\HKEY_LOCAL_MACHINE\SOFTWARE\Microsoft\Win dows\CurrentVersion\Authentication\LogonUI\Backgro und. If not, you need to add a DWORD value having the name OEMBackground. The next step required is to double click on the OEMBackground and set the value to 1 from 0. Navigate through %windir%\system32\oobe from the windows explorer and create a folder named Info. Open that folder and create another folder named backgrounds. Locate an image you want to set as background image and rename it as backgroundDefault.jpg. After that, place that image into backgrounds folder so that you can view it as the background image for welcome screen. 1.Firstly open the 'Start' menu of your PC. 2.Now tap on the 'Run' option. 3.Now type 'regedit' in the run option. 4.Now a popup with the registry editor will open. 5.Now you will find some options in that menu. 6.Now Right click on the 'HKEY_LOCAL_MACHINE' and tap on the option of 'Find'. 7.Now a search menu will get opened ,now type the OEMBackground in that search box and tap Ok.
8.Now tap and open the OEMBackground and assign value of 0 or 1. 9.Now open the windows explorer and type the %windir%\system32\oobe path. 10.Now a newfolder named info will be present and also the it consists of a folder named 'Backgrounds'. 11.Now select a wallpaper you want to set and rename it as backgroundDefault.jpg and place it inside the folder backgrounds and note that image size should be less than 245KB in size. As you want to change the background screen you have to follow the below steps . 1) Press the right click of mouse and select personalize option. 2) In which select change desktop background image . 3) Now browse the image that you want to be in the background image . 4) Apply the settings that you want like shuffle allowed or not etc . 5) Finally click the save changes button and your desktop image will be changed successfully . So just go through above steps . 1. Install and run WinBubble. 2. Click the Windows 7 tab. 3. 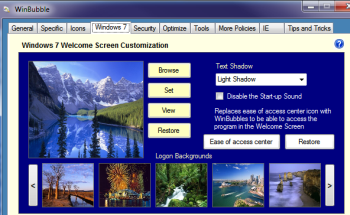 Scroll through the available Logon Backgrounds (which are drawn from Windows' available wallpapers) and click the one you want. You can also click Browse and choose and JPG image on your hard drive. 4. Click Set to lock the new image in place, and then click View to get a preview of how it'll look. Not happy with the results? Choose something or click Restore to bring back the original background. Now, every time you start or shut down Windows, you'll see the new background. It may appear for only a few seconds, but at least it's the image you want, not the one Microsoft sticks you with.